It is not a secret to anyone that life sometimes can be cruel and unpredictable but that is when the people close to us help us get through everything. The thing is that very often there is a couple of people that remain by your side no matter what even after they have seen you at your worst and these are the people you should value most. That is why if you know some people who you would anything for you need to know how to show them that they are important to you too. 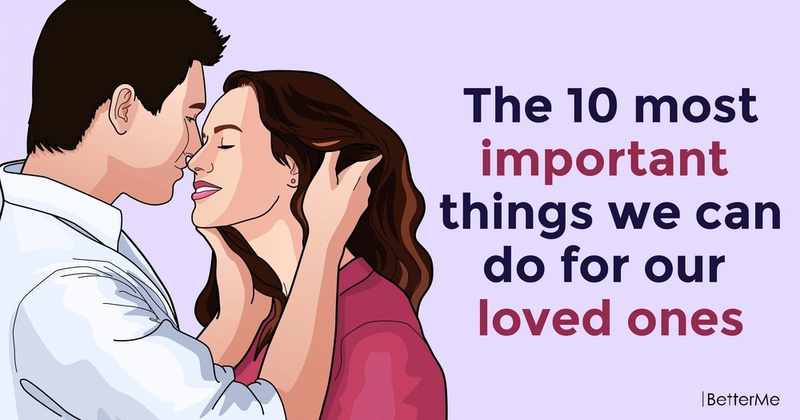 That is why we have gathered here a list of ten most important things you can do for the ones you love. Learn them and make people you love happy! It is so easy to be near someone but to be so far away. That is why when you spent time together – make sure you are there for real. When someone you care for talks – you listen, but listen not only with your ears – listen with your mind and heart it is important! The truth may be bitter at times, but for people, you love it is better than a thousand sweet lies. No one is perfect and neither you are. That is why if your loved one has flaws – learn to accept them the way he accepts yours. Don’t you ever assume anything until you hear what the accused person has to say and the way he explains his actions or behavior. We all make mistakes that is why it is so important to learn to forgive. Think about – tables turn and sometimes you may turn out to be the one looking for forgiveness. It is very important to feel appreciated that is why if you truly admire someone’s work – tell them about it out loud! It is so easy to take, but sometimes it is important to give, keep it in mind! It may seem that the first impression never lies, but it is still better to step aside and watch some more. Learn to love people close to you unconditionally, don’t you ever think that there are people who do not deserve to be loved because of their flaws or behavior!